Tonight has brought cool spring showers, and warm toasty fires. I had the pleasure of speaking at a Big Sisters fundraiser today after work. I’ve been a Big for three and a half years, and recently signed up to be a media program ambassador. Basically I get to go to different events and extol the virtues of this seriously amazing, life changing organization. 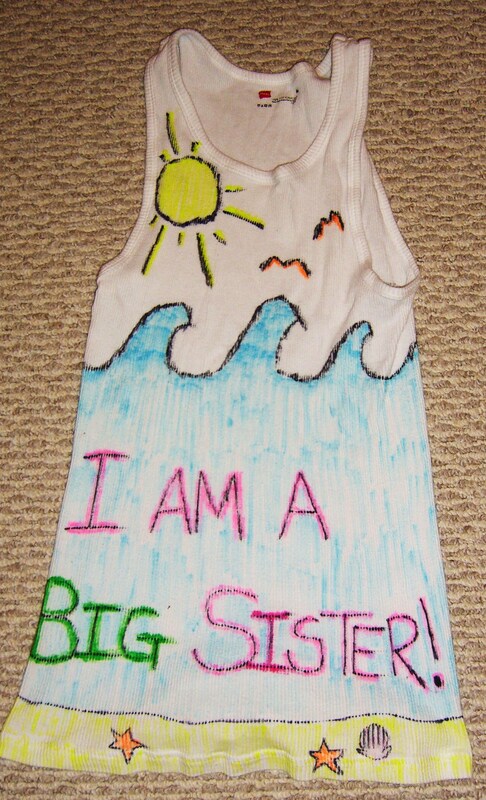 The tank top I made for the half-marathon I ran to raise funds for Big Sisters. This role is great fun, and is rad as heck. I love working with this association, and want to do whatever I can in my power to raise awareness and funds for their different initiatives, while at the same time stoking, or perhaps piquing the interest of potential Bigs. It was such a pleasure to chat with the attendees after I had given my speech, and relay a bit more about my relationship with my Little, and what is required of all prospective volunteers. After a long day at work, and then participating in the fundraiser, it is pretty nice to be sitting here with Ms. Nymeria and Mr. M.
We’re watching Serenity while working, and purring, and writing, and planning. And I don’t think I’ll ever get sick of the Oaty Bar theme song either. Also, Nathan Fillion re-tweeted me the other day, which was pretty darn fabitty fab in the extreme. 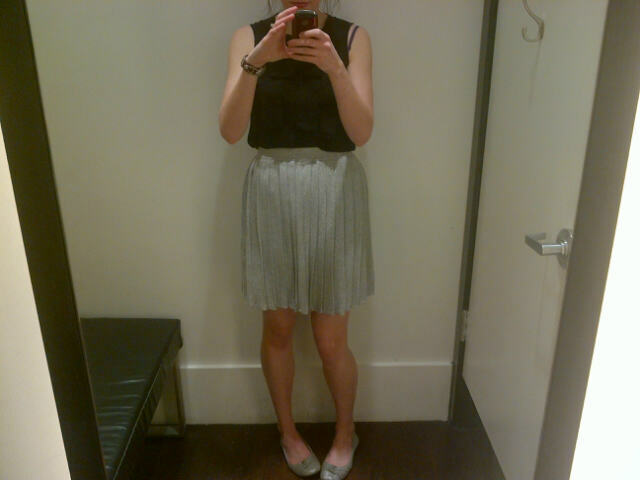 Today I went back to Club Monaco to purchase my sparkly, pleated beauty skirt. Of course, since I’m a complete broomhead, I forgot my student card, so I ended up having to put it on hold for purchase tomorrow. It will be mine, oh yes. One Skirt to rule them all; One Skirt to find them; One Skirt to bring them all, and in the darkness bind them. Oh yes. I will keep you abreast on this story (and my madness) as it progresses. Also, I am very proud to say that I ate a healthy breakfast this morning. Or at least healthy by my standards, Mlle. Beignet au Pomme. 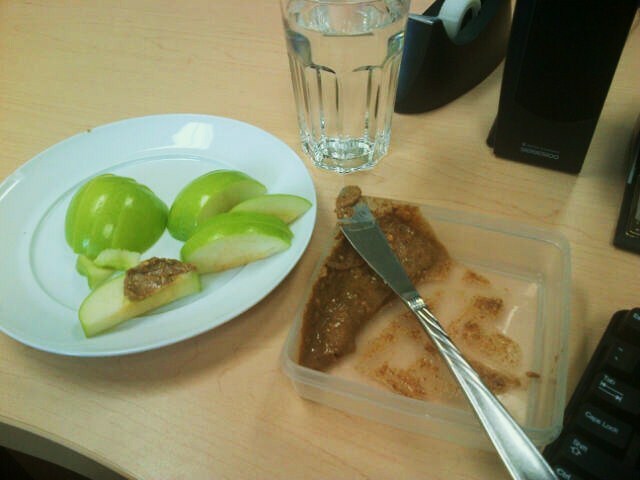 Granny smith apple and organic crunchy almond butter? Cor, I am in absolute heaven. There is a new government in Alberta, with the first female premier elected as head of the province; Ontario remains just beyond the cusp of an election, and Quebec may soon be heading down the same road. Also we’ll see what happens in France as they move into their next phase of voting. HEAVY STUFF. Like, this and the Satanic Verses are basically the same thing. It would seem the phrase, “I know up on top you are seeing great sights, but down here on the bottom, we too should have rights” is too contentious a topic for the province’s youn, impressionable, and highly malleable minds. Someone get me a fainting couch, because I’m clutching my pearls for all of Canada. What do you all think, my lovely readers? Have we finally crossed the line? And how was your Tuesday? And extra points if you can do it in rhyme. Hi. Can we be friends? Now, I’m not actually saying that old Dave is a doucheboggin, but a google search of his name sure did hurt my poor noggin. Is to go back to the pot twice as much for more honey. Separate post because I’m not going to defile Captain Tightpants’ name by putting it in the same comment as … that guy… up there. Okay, so anyway, that is super awesome. As is he. As Captain Tightpants and as Captain Hammer. He can captain whatever the hell he wants, as long as he wears the pants. Hell, he can captain if he doesn’t. I’m not about to get picky. I want to tell you that being a BS is awesome but I’ve been blindingly distracted by the awesomeness that is Firefly. And now I have those songs stuck in my head. That is my same reaction when anyone tells me that’s how THEY feel about Firefly! OMG, Dudette, when I say you make me laugh, there is absolutely not fallacy being committed there. Like, if I type LOL, you better believe the guffaws are flowing, freely and easily. YES, the retweet was ridiculous in the extreme. I kind of felt like I was going to hyperventilate for a few minutes. Keep fighting the good fight Ms. Skies. I like your style! Ha ha I meant to mention the MAAN quote when I saw it but got distracted – out of curiosity what’s your feelings on the 1993 version? Jeeeebus. Could I have been any more out to lunch when I wrote my first reply to you? Holy crap, do I ever apologize. I was all over the place there! In my defense, I was replying very early this morning, and in my enthusiasm to reply to your comment I seem to have briefly lost my ability to string together a coherent sentence. MY APOLOGIES! I also loved Robert Sean Leonard so much in the film that after I saw it for the first time (when I was 12) I wrote him a letter telling him how much I enjoyed the movie. And he wrote me back! Pretty cool sauce. Hey, while we’re on the subject of how awesome our mutual taste is – and on romances – if you ever wanna get all good and girly over BBC’s Pride & Prejudice, I’m there, baby. For a minute there I thought you’d gotten far too involved in the Bioshock games for your own good! But wow, that mentoring program is awesome in the extreme, you must feel very proud to be a part of it. Way to go Ethel! As I squelched from place to place. Trying to lip-read my singalong. Flying buffalo what anybody thinks so long as I get bloody good at throwing stupidly heavy lumps of metal around the landscape! And didn’t burn the dinner. That makes me a winner! Better believe it, my old pedigree chum. Don’t mess with the eccentricity, you may get shocked! HOLY SMOKES! THAT WAS BLOODY BRILLIANT! I am actually a little bit in love with that. What an amazing thing to wake up to and read :) Also, I’ve said it before, and I’ll say it again, you are FUNNY AS HECK. Love the image of you pirouetting in the mud. Love Joan Jett and the nervous tourists. You are a winner and a half. I may also start calling you Fiona for good measure. Kickass, Warrior Fiona – mind you. Man, I am so glad I tweeted that quote about James May and my husband, or else our paths may never have crossed! Ah, sweet serendipity via Top Gear LOL Gotta love it! You’re welcome. I love spouting doggerel. And singing at top volume in the car, for that matter, with exaggerated mouth movements! Heh. Plodding away at a monotonous Pace. But right now I feel quite patronised. Don’t you think I’d know a thing or two? Looked to the clock and did I dream?! One could never be back home too soon****. *Possibly hallucination of fatigue and boredom. You can see I started off with a serious attempt, but then the poem totally derailed. You can’t know what you’re going to write before you write it, else it’s not an experience in poetry so much as one in dictation of one’s thoughts; I just tend to know a little less of where I’ll end up than most. I enjoy reading your blog, though often have little to say. Keep up the good work- I’m surprised you’ve time to write with such an active life. Inspirational. This is fabulous! And I cannot even begin to tell you how much I love the asterisks. It’s like reading Shakespeare out of the assigned grade ten text (where they decode all the wording). Seriously fab. Also, “I just tend to know a little less of where I’ll end up than most” could be the motto of this here blog spot, so I definitely not one to get upset over a little meandering. Heck, Neal Stephenson is one of my favourite writers, and he is the king of the tangent. I didn’t know you were a Big, that’s so cool. And sounds like you’ve really stepped into a great role with the organization. Very inspiring, especially for your Little! Excellent post, you’ve made my day and I hope you have a very fantastic one yourself, Amiga! Yes! Friendship clenched. This vice is on now baby! :) So glad I could bring a smile to your beautiful face. And I really, really love that we can nerd it out together. It makes my little heart smile! Also, I did an actual out loud fangirl shriek when I saw the retweet. Pretty funny, but hey, I’m not ashamed! I had a lot of fun, yay! I’m not kidding, it was the best. Not the best, but do I at least get 10 points? Are you living in Sweden now? Or just studying the language at school? Thank you so much for the wonderful note. I hope your Thursday proves to be just tops! I live in Sweden, which is pretty excellent – especially now that we see the sun again. No doubt! Sweden is very high on my list of places to visit. I went on a tear for a while and only read books by Swedish (and other Scandinavian) authors. My mom and I are planning on doing the Kurt Wallander tour around Ystad – it’s on the bucket list! That sounds awesome! Sweden is ridiculously beautiful in the summer, I recommend coming then. Smart to stick to the south of Sweden ;) I’m going to attept to read Stieg Larsson’s books in Swedish – wish me luck! 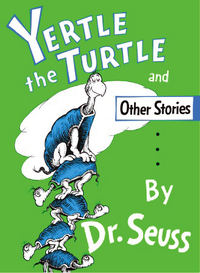 And I’m at work… so no time to write a fabby Yertle-y poem… but I do love your skirt. Maybe I missed it… but where did you get your blue blouse that you nom nom love? Hey, no worries! I’m not the reading police. Nor the poetry police at that. (and judging by the dreck I churned out betwixt the years of 13-17, I would be the first to be thrown in poetry jail at that. Do you dudes have Jacob in NJ? I know it’s a Canadian brand. That is where I purchased my nom nom blouse. Which I am (nom nom) wearing today! ha ha, I know you are not the reading police. If you were, I would be in effing trouble!!! HAAA. It seems we do not have Jacob here, but I must say that I checked out their website and I like it. Cute stuff. I also dig their “no retouching” photo policy. Rock on Jacob. For the record… I have been in Vancouver once… though it was unfortunately just a drive by, or drive through — we were “escorted” to the airport by Carnival cruises after our Alaskan/Inside Passage trip. We should have taken an extra day or two and hung out in the V. It seems like a really nice (and clean, for crissakes) city.